My "Tattered Frannies" Collection is yet another in this series! So you know I love all things folksy and "homemade" right? Well that love is the inspiration for this kit. What kind of a true quilting/fabric lover would I be without "stitching" up some primitive, country-style ragdolls and flowers? Well not a very good one.. that's for sure. 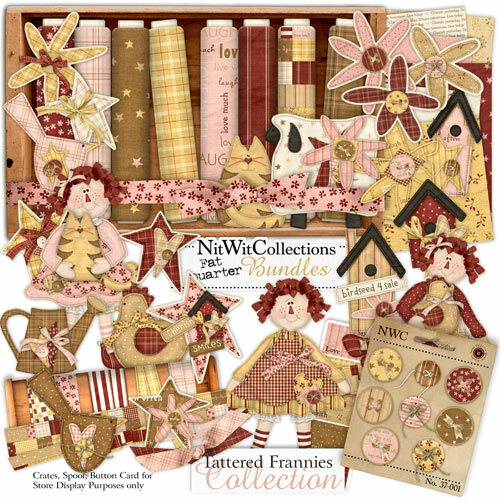 So here it is folks... a kit full of "Frannies", chickens, sheep, and all the things you'll need for your primitive layouts! Hope you enjoy it too! Gotta love them dollies, huh?